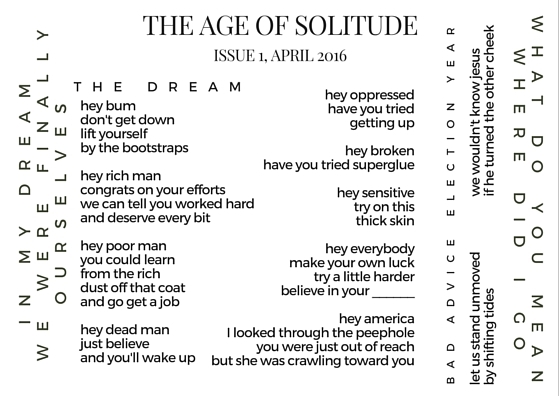 I have a new piece published in Dallas-based AUSTERE Magazine, a journal by very cool people doing incredible work. Check them out. My piece, “Trophy Kids,” can be read here. You can also purchase a print edition from their online shop. You might recognize the name “Trophy Kids” from the zine I released with my album, which is available for purchase here. The name is a defense of the millennial generation, but I’ll let you see for yourself what I mean. Thanks for reading. More soon. Since I left my teaching position last summer to pursue my Master’s in Theological Studies, I have struggled to find a new route to take with this blog. Over the course of my three years in the classroom, it slowly turned into my reflections on teaching. The intent was always to make this a space to inspire people with stories, and I’ve been thinking recently of how to do so through others’ voices, especially millenials who often receive undue criticism and baseless stereotypes that seek to degrade us while we work to become who we are in this world. I asked Natasha (Tash) Nkhama, a former student, to share her insights about an incident that happened in her first semester at Baylor. Our conversation is below. As an undergraduate, I interned with several youth groups in local churches. When I started my first internship after my freshman year of college, I was 19. On the first day, the youth minister overseeing me and the other intern informed us he took a job in another state. He’d be gone in a week. Most 19-year-olds are not given the responsibility of 50 teenagers on summer break (and rightly so), but there I was, learning the ropes of youth ministry with the other intern who also had little experience with leading youth before this. I look back on that summer and laugh often, how many mistakes I made, how much I got right by chance. I still call most of those teens (now adults) friends. I’m in graduate school with one. Another is my girlfriend’s best friend. One leads worship at the church I just started attending. Lately, though, my mind wanders to one night that summer that could have gone wrong. Before the reader (aka my mom) worries, this story has nothing to do with the teens, and more with the aftermath of poor logistical planning on my end. Toy Story 3 released that summer, and many of the teens wanted to attend the midnight premiere. Most of their parents would not allow them to go to the movies that late without an adult, and somehow 19 years on earth qualified me for the role.